Rarely do I get this excited over a meatball (a chicken meatball at that) and rarely do I post a series of photos...but this is one of the few times...I'm finding it extremely difficult to put into words...just how passionately I feel towards these little beauties - all browned and stuffed with cheese! And all I did was take my Chicken Meatloaf recipe and instead of "loafing" - I "meat balled" - stuffed with cheese - closed the meatball - browned in olive oil on the stove - then baked in a 400 degree oven for 15 minutes! Perfection! *Yielded 34 decent sized Chicken Meatballs. *Make them smaller, stick a toothpick in them and what a perfect hors d'oeuvre! Let's get up close and personal with this hottie! I can see why you felt in love with these meatballs. This melted cheese inside them made me feel like that too. Thanks a lot. My stomach is growling like crazy. I will eat this with mashed potatoes and a salad and maybe a green vegetable. Wash it down with some burgundy. Ummm. HAH!! Love the before picture-- kind of like when I get up in the morning :) These look amazing! If you're making them for a party, I assume you can freeze them once they've been stuffed and before they've been browned? Have you ever tried this? Chicken meatballs are new to me. What a great idea. Now I've got to go check out Marvin Gaye. Loved his music. OH YUM!! I love oozing cheese...is that wrong? I've made something similar to this with beef meat balls...definitely will have to try it with the chicken...they look wonderful!! @The Food Hound - I like how you think! To be honest, this was the first time I made the meatball version and so I have never tried freezing but I bet they would do just fine! Oh come on, please marry me!! These are so inventive and great for appetizers. Exciting recipe this is! Chicken nuggets stuffed with my favorite cheese! What could be better? I could have these for breakfast,lunch and dinner! Thanks for sharing. These do look amazing. The image of them with the cheese oozing out isn't going to leave my head either. oh my gosh, those look warm, delicious and basically like a bite would transform you to another world! Fantastic meatballs! They sound and look delicious! I definitely have to try this. Those photos have me drooling. Thanks for the MG, love his songs! You sold me with the cheese! 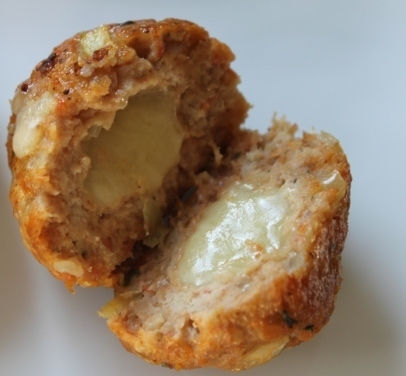 I love cheese stuffed meatballs. Love the photos and cannot wait to try these. Thanks for sharing.